However you use your truck, chances are good that you carry things in the bed that are valuable. While it might not be a big deal to leave some things in the bed when your truck is in your garage or in your driveway, you probably don’t want to leave tools or recreational equipment hanging out in the back when you go to the store or head to the office. One of the easiest ways to protect everything in the back of your truck is with a tonneau cover from LINE-X of Sioux Falls. We have tonneau covers that are designed and built to fit many different makes and models. Call us today or stop by our shop to learn about your tonneau cover options. There is no better place in town to find bed covers and other truck accessories, including LINE-X bed liners, so when you need to take care of your truck, you can count on us. Read on to learn about two important reasons why you need to invest in a tonneau cover. No one wants to believe that they could have their tools stolen out of the bed of their truck, but dealing with a theft is much worse than taking a few simple precautions. 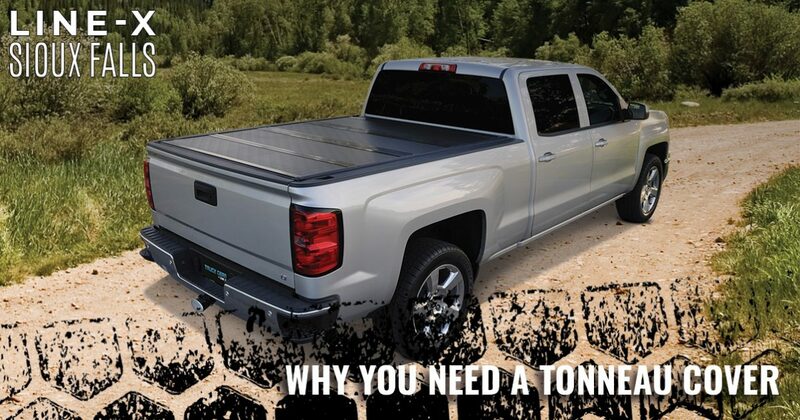 If you don’t want to invest in a full truck topper, a tonneau cover offers you substantial protection without the added weight and size of a full topper. At LINE-X of Sioux Falls, we carry a variety of tonneau covers, including roll-up, folding, and hardshell versions. We have options that will provide you the security and access that you need without costing an arm and a leg. If you are particular about color, we have covers that will match your truck as well as colors that will provide an exciting accent color! Tonneau covers will protect your goods from being stolen, and they’ll also help improve your gas mileage. While trucks are excellent for hauling things, their design has one huge flaw — the tailgate. With the tailgate up, air flow stops and creates a significant amount of drag. This drag is not good on your miles-per-gallon. A tonneau cover helps direct the air flowing over the cab of your truck right off the back of the vehicle, greatly reducing drag. While a tonneau cover won’t double your gas mileage, you will notice that you spend less time and money at the gas pump. Contact LINE-X of Sioux Falls today to learn more about tonneau covers, truck accessories, and bed liners!